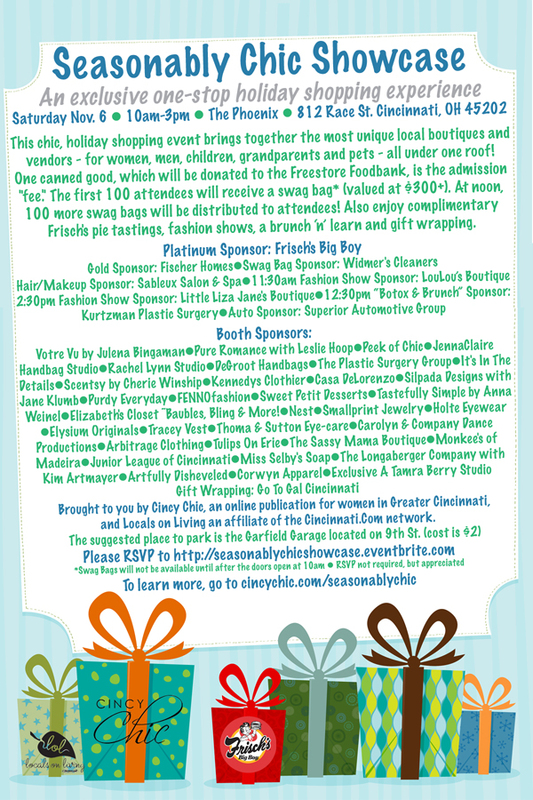 Save the Date: Seasonably Chic Showcase! As much as I love shopping, holiday shopping always stressed me out. As I’ve said before, I don’t like to get things people pick out for themselves. I like to put a lot of thought into it and give them something special. Great in theory, but finding those one-of-a-kind things are a full time job. So, I took my wish list for what I’d love to have in a holiday shopping event and created it! It’s called the “Seasonably Chic Showcase.” The second annual event will be going on Saturday November 6 at the Phoenix downtown. To get you all excited about the event, Cincinnati.com and I put together a giveaway where you can win goodies from our Seasonably Chic vendors (valued at $2,500+!). All you have to do is enter and you might be randomly selected to win! Click here to learn more about and enter the giveaway. Click here to RSVP for the Seasonably Chic Showcase. And click here to RSVP to the brunch ‘n’ learn we’ll have at 12:30 at the Seasonably Chic Showcase! One canned good, which will be donated to the Freestore Foodbank, is the admission “fee.” The first 100 attendees will receive a swag bag* (valued at $300+) and at noon, 100 more swag bags will be distributed to attendees. Also enjoy complimentary Frisch’s pie tastings, a free brunch ‘n’ learn, fashion shows at 11:30am and 2:30pm, and free gift wrapping!